I am back from my short break in the sun, back on social media and finally back with a little recap from Paris. 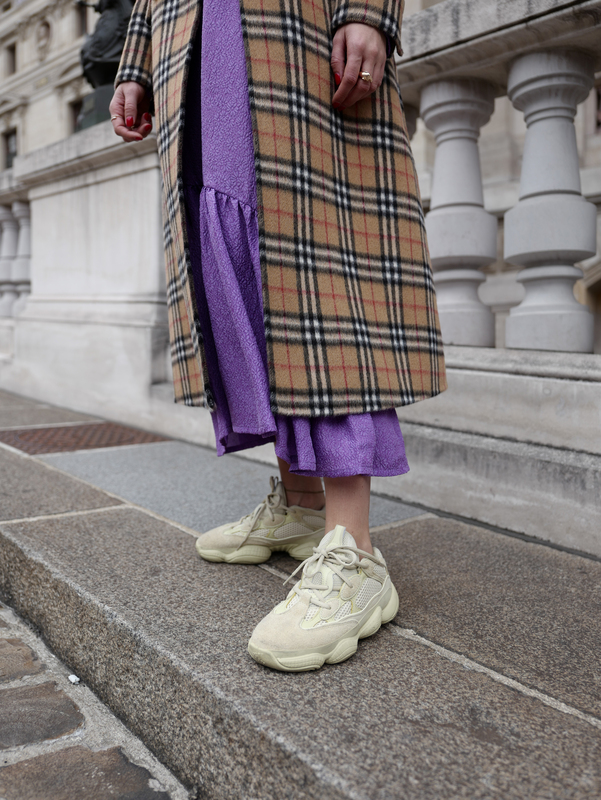 Even though some of you might have already seen my Paris Fashion Week outfits on my Instagram feed, today’s blogpost will focus on them in detail. Check out the outfits I wore throughout my stay and read everything about season’s new must-haves. I love traveling to Paris for Fashion Week – especially in autumn. The beautiful houses in the autumn sun, the city vibes and atmosphere, the well-dressed people. When it comes to fashion, autumn definitely is one of my favorite seasons, too. Boots, cozy sweaters and coats. Not to forget the endless layering possibilities. Whereas most of the time I go for neutral and natural colors, I decided to add some extra color and statement pieces to my new fall wardrobe. I found all my Fashion Week looks on stylebop.com. Over the last couple of years, Stylebop has developed into my number one destination for luxury shopping. You can simply buy everything from apparel and bags to accessories and shoes. It offers a perfect selection from iconic brands to emerging cult designers. The main actor in my first Fashion Week look is this cozy and super comfortable Stella Jean mohair and wool pullover. The current Stella Jean collection is inspired by the 11th Berlin Olympics games of 1936. Unexpected colors, colorful paintings and prints mark the collection that is based on a variety of cultural inspirations. Stella Jean skilfully balances powerful proportions and interesting shades for an energetic fusion. I really love the pretty shade of peachy orange. It is such a fresh and cheerful color. The pullover has a round neck, ribbed trims and a slightly boxy fit. It comes along with the brand’s signature logo patch on the chest. I decided to pair the colorful pullover with a pair of neutral pants. I always try to find colors that balance each other and create a harmonious outfit. Khaki is a timeless and neutral color that can simply go with anything. My new Citizens of Humanity overall is the perfect companion for autumn. It is made of pure cotton and comes along with long sleeves and a straight leg. Large chest pockets, side pockets and a classic collar complete the design. Instead of wearing the overall the classic way, I decided to tie the sleeves around my waist and wear it as a pair of pants. The knotted sleeves add a laid back attitude to the whole look. My favorite Gianvito Rossi boots pick up the colors from the pullover again and complete my outfit. My second Paris Fashion Week look is definitely the most eye-catching one and I’m truly into it. As I mentioned in previous blogposts before, I totally love the iconic Burberry check pattern. I instantly fell in love with this badass coat. It is such an outstanding statement piece and perfect when temperatures start to drop even more. The double breasted long coat is made of high quality alpaca and wool and is beyond cozy. It comes along in the brand’s iconic house check and a structured silhouette. I decided to go for a lot of color again and paired it with my new purple Baum und Pferdgarten dress. I can’t see myself wearing purple regularly but ultra violet definitely is one of THE colors for winter 2018. The contrasting styles and colors mix and match and create a harmonious picture after all. Conservative aesthetics meets urban coolness. My Baum und Pferdgarten maxi dress is made of a high quality silk-blend. It has long sleeves, a round neckline and a flounce hem. I went for sneakers instead of heels or booties to create an urban and relaxed look. Double denim is always a good idea. It can be kind of tricky to pull off, but when it’s done correctly, it is the most stylish thing to wear. I really like white jeans. They have become a main stable in my wardrobe. White is always flattering and makes our skin glow. Whereas a lot of people only wear white jeans in summer, I think they are a great all-year alternative to blue or black trousers. Plus: white immediately adds a chic and sophisticated attitude to your outfit. I am wearing a white Proenza Schouler denim jacket. It has a cropped fit with two flap pockets at the chest. The adjustable belt ties mid-way around the body and creates a flattering silhouette. 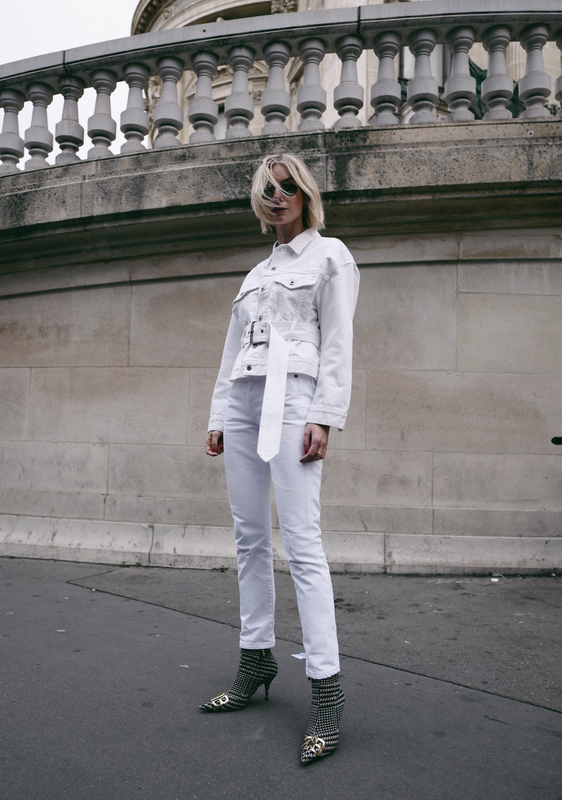 I styled it with matching white ReDone jeans and my beloved Balenciaga booties. The booties are a special eye-catcher. They are conspicuous but not obtrusive and perfectly fit into the overall picture. Do you like my outfits? Which look is your favorite?